I am flying today to Orlando, Florida, for a weekend of risk-and-insurance jollity with my fellow CPCUs. If you should find yourself loitering about the Marriott World Center hotel on Sunday morning, you might try sneaking in to the annual Mock Trial, in which I will be fighting the good fight on behalf of my fictional client in a spirited Appellate Cage Match of vasty deepness. The sign above was photographed in the Orlando International Airport in 2008. I do not know if it is still there. Much is communicated by this sign, though but little is revealed. It is comforting to know that Security Theater, like the vaudeville of old, still has a place for a good dog act. The promise that I might be permitted to help sniff luggage is intriguing. The promise that I will be fined for smuggling if I declare my food, plant, and animal products is dismaying. The question of whether the beagles, as animals, must declare their own products is unanswered, as is how best to declare them in polite company. Photo by Mark Kobayashi-Hillary, via Wikimedia Commons, under Creative Commons license. When I need to make a court appearance in downtown Los Angeles, I generally hop on Los Angeles' Metro Rail light rail system. There is a station convenient to my office, and another downtown convenient to the county courthouse, and the roundtrip fare is much less than the cost of parking. As with most any other public facility, Metro Rail stations come equipped with helpful signs to alert passengers to the Do's and Don't's of Good Transit Citizenry. So many rules, so much good advice, and all conveyed in the three official languages of California Public Spaces: English, Spanish, and Pan-Global Semiotic. "We Warned You It Was Sticky"
"Forward and Lateral Passing Only"
One last vacation-related post, a week after the fact. As we traveled through the Four Corners region, we had semi-brushes with stories that were topping the news in places that we visited. Here are two photos that I took -- in an old-fashioned chemical way -- that vaguely relate to them. 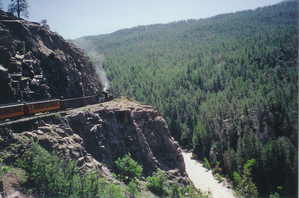 First, a photo of the Durango & Silverton Narrow Gauge Railroad as it rounds the famed horseshoe curve heading north along the High Line above the gorge of the Animas River. Because the spot permits those on the correct side of the train their best shot of the locomotive on the entire trip, you can imagine how many hundreds of thousands of photos there must be that closely resemble mine. A local rafting guide known for his robust sense of humor and a tourist from Texas were identified by authorities Saturday as the men who died on a commercial rafting trip on the upper Animas River. Darrel Bogenrief of Durango was about 25 years old and Scott Licona of Lumberton, Texas, was 30, said Butch Knowlton, La Plata County's director of emergency preparedness. Bogenrief had been a commercial rafting guide with Durango-based Mild to Wild Rafting for at least five years. Local rafting guides said he was renowned for his disarming jokes and his fondness for the challenging upper Animas River. High water this year has led to treacherous conditions on rivers. There have been other reported deaths in Colorado this season, Knowlton said. Two people have died on separate commercial rafting trips since Memorial Day in New Mexico. The two men died Friday after a raft guided by Bogenrief flipped in the second drop of Ten Mile Rapids, a long stretch of turbulent whitewater north of Needleton in San Juan County. There were five people in the boat, said Kenneth Blazzard, a tourist from St. George, Utah, who witnessed the accident from another Mild to Wild raft. Bogenrief briefly turned the raft upright before falling out, Blazzard said. No one made it back into the raft, he said. Three survivors made it to the banks of the river, while Bogenrief and Licona were quickly sent downriver by the racing rapids. The southbound train that stopped to pick up the party later in the afternoon was not ours. We did not know anything about the incident until we saw the local paper the following morning, as we were getting ready to head south to the area of our next photo, which relates to an interesting but not so tragic story. 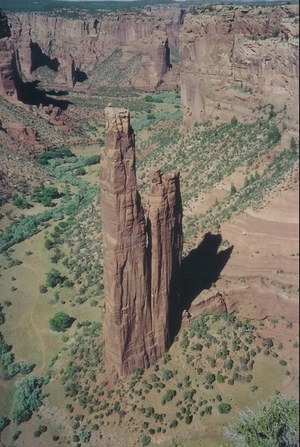 Here we have a picture of Spider Rock, which stands at the bottom of Canyon de Chelly, Arizona. Canyon de Chelly is unusual among the units of the National Park Service in that it is operated in cooperation with the Navajo Nation. The Monument exists entirely within the Navajo reservation, and the Navajo themselves have lived and farmed on the floor of the canyon for several centuries. Because of that occupancy and because of the Navajo's sacred associations with the landscape -- Spider Rock, for example, is associated with Spider Woman, the supernatural being from whom the Navajo first learned the art of weaving -- access to the canyon floor is restricted: with the exception of one trail to the White House Ruin, visitors are not permitted to enter the canyon below the rim except in the company of an approved Navajo guide. A group of Canyon de Chelly residents are tired of living in a time warp. Clara Gorman, who lives near Spider Rock, said the U.S. National Park Service, which oversees Canyon de Chelly National Park, prohibits canyon residents from living in modern houses. She said the reason for the park service policy barring modern homes is for the benefit of tourists. 'It's like we're being on display for tourists,' Gorman said. The story is somewhat vague concerning both sides' positions, and the Park Service seems not to have had a really authoritative spokesperson available to discuss the protest or the residents' concerns. I assume the residents' "modernization" plans would not include a high rise casino with Spider Rock in the atrium lobby. Hello, all. This Fool has now returned from one of the Best Family Vacations Ever. Because that Vacation was computer-free, the return has entailed sifting through and reading or deleting a couple of hundred accumulated e-mail messages, sifting through and (mostly) not reading several hundred weblog posts accumulated in the RSS feed, identifying all the new court decisions that came down while my back was turned that will need to be digested and discussed at the Other Weblog and, of course, the necessity of preparing my report to the class on What I Did on the aforementioned Vacation. The "Anasazi" are disappearing. More accurately, the use of the term "Anasazi" for the peoples who constructed and lived in the cliff and mesa-top dwellings at Mesa Verde and various other locations in the Four Corners region is on the wane. It is now generally accepted that the builders of the cliff dwellings in the late 12th and early 13th centuries are the forebears of the various Pueblo peoples of today. It has also been well-accepted for a long time that the earlier peoples are not the forebears of the Navajo, who only entered the area several hundred years later. "Anasazi" is a term from the Navajo language referring to those who built the by-then-long-abandoned dwellings that the Navajo found when they arrived. The term is variously translated as "ancient ones," "enemy ancestors," or simply "people we don't know." Understandably, the Pueblo peoples of today are not all that taken with having their ancestors referred to by a name -- and a none too flattering one, really -- drawn from someone else's language. "Ancestral Pueblo" and "ancient Pueblo" are therefore increasingly favored as the appropriate description, at least until a term drawn from a contemporary Pueblo language gains general acceptance. Somewhat more on the subject here (scroll down), as well as here. "Anasazi" is unlikely to disappear altogether anytime soon, I suspect, as the sound of it maintains a compelling air of mysteriousness that we non-indigenous sorts of European origin, and those who market to us, find hard to resist. If you find yourself in the vicinity of Moab, Utah, and would like a very comfortable place to stay, drive 14 miles out of town up the Colorado River to Red Cliffs Lodge. The Lodge is located at a bend in the river, surrounded by the looming red rock from which it takes its name. The accommodations are best described unpretentiously plush. The Castle Creek Winery is located on site, producing wines (some of which incorporate not only Moab-grown grapes but also grapes drawn from the seemingly even more unlikely source of southern Arizona) that while not spectacular are certainly pleasant and eminently drinkable. Proof that there can be no true escape from those omnipresent weblogs, even in the Wilds of Utah: our room at Red Cliffs Lodge included a copy of the latest [May/June 2005] issue of American Cowboy magazine, the cover of which touts an article by none other than uberkulturblogger Terry Teachout. For the night before spending our very full day in Mesa Verde, we stayed inside the Park at the Far View Motor Lodge, a study in contrasts. The room (which had heat -- not needed, with daytime temperature in the 90s -- but no cooling equipment) was deeply mediocre, suited to a mid- to low-level Best Western, with only its location inside the Park (with accompanying spectacular views) to recommend it. On the other hand, the restaurant at the lodge -- the Metate Room -- is simply tremendous, providing easily the best meal of the entire trip: creative Southwest cuisine with an emphasis on local ingredients, a seriously interesting wine list, attention to detail throughout, and the opportunity to Commune with the Sublime by taking in those views until the sun went down. What's a metate? It's "[a] flat or slightly concave stone base on which grain, nuts and seeds were ground using the smaller mano." Ancestral Pueblo sites are full of them. What did we drink with dinner? A fine wine from Colorado, of course: the very tasty 2003 Merlot (unfiltered) from the nearby Sutcliffe Vineyards. A profile of proprietor John Sutcliffe is available here. Pictures? I can't promise any. We are still operating in the old-fangled world of chemical-based photography, so I am waiting to see what will develop. If there is anything really compelling, perhaps I will post a scan. And now, back to the workaday world. . . .
One of the things I enjoy about resorts is the concierges. They are like reference librarians for the frivolous and self-indulgent.